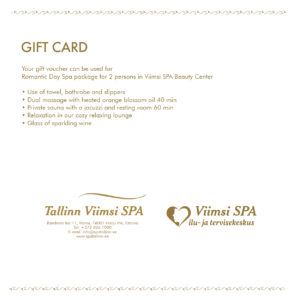 Tallinn Viimsi SPA gift card | Buy now Online! 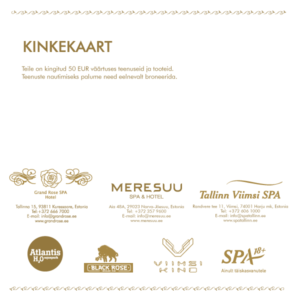 An ideal opportunity to give your friend or loved one a gift card that is valid at the Tallinn Viimsi SPA, SPA18+, Atlantis H2O Aquapark, Viimsi Cinema, Black Rose Pub, Meresuu SPA & Hotel and the Grand Rose SPA Hotel in Saaremaa, offering them some luxurious relaxation and the best vacation possible. The joint gift card can be used multiple times, up to the extent of the selected limit. A relaxing holiday in one of three spa hotels of Estonia – MERESUU SPA, VIIMSI SPA* or GRAND ROSE SPA. Enjoyable meals at restaurant MELOODIA in Narva-Jõesuu, at BLACK ROSE PUB in Viimsi or at restaurant ROSE in Kuressaare. Private time with the darling one in exclusive SPA18+ Sauna Centre. 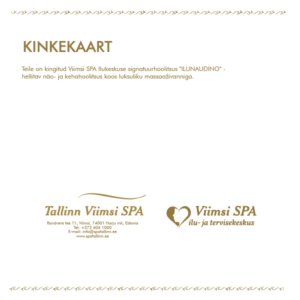 *Is not valid at the partners of Viimsi SPA– SushiTime, ArsMedica, Lumen teeth therapy, Optika and the hair salon. Add a gift card with the suitable amount to your shopping basket, confirm your order, and pay for the gift card via your Internet Bank or VISA our MasterCard credit card. E-shop payments can be done via Estonian bank links or Visa and MasterCard debit- and credit card payments. Internet bank links have been established with the following Estonian banks: Swedbank, SEB, Luminor, LHV, Danske Bank, and Krediidipank. Maksekeskus AS will act as the payment intermediary. Purchased gift card will be sent to your e-mail address, after which you can print it out yourself. Gift cards purchased from the e-shop cannot be issued on-site at the hotel. Gift cards can be purchased both in monetary value and as a certain service. Gift cards can be used within the validity period noted on the card and within the limits of the sum or service. A gift card cannot be exchanged into money. A lost card shall not be substituted. You can purchase gift cards with a pleasing service or value at the receptions of the Meresuu SPA Hotel, Grand Rose SPA or Viimsi SPA Hotel, Viimsi SPA Beauty and Health Centre, at the counters of Viimsi SPA Sports Club and Sauna Centre, SPA18+ and Viimsi Cinema, at the ticket office of Atlantis H2O Aquapark. We will prepare you a suitable gift card, adding the name of the receiver and a personal congratulation or wish (maximally 10 words). You will receive the gift card which is beautifully designed on glazed paper, in one of our group’s spa hotels – at the reception of the Meresuu SPA, Grand Rose SPA or Tallinn Viimsi SPA hotel. When required, we will send you a gift card by registered post (post costs will be added to the invoice).